Sometimes you have a small room and you want to make it bigger! But how can you achieve this? These are a collection of helpful tips and tricks to make a room look bigger, when it’s actually very small. Use the same color throughout the room, but try to use different shades. It makes the room seem more open and airy. The colors are different enough that it draws your attention away from the smallness of the room but similar enough that your eyes aren’t focused on the clashing colors which can enhance how tiny the room is. 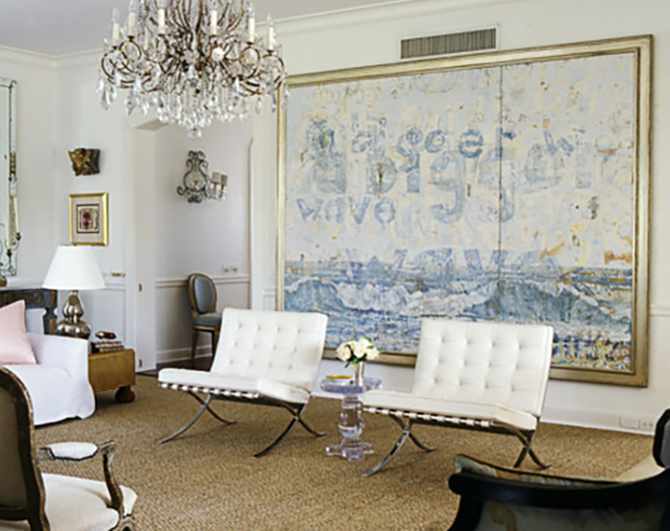 Using a large, dramatic piece of art can make the room feel more expansive. The eye is drawn to it instead of the walls and ceilings. The subject of a piece of artwork can also open up a room. If you choose to use landscapes or seascapes, it will almost feel like another open window, making the room seem larger. Also make sure to use light, clean frames instead of heavy ornate ones. The heavy and darker the frame, the more likely it will weigh down a room and make it feel closed in. Placing a mirror across from a window is the ultimate way to reflect light into a room, making the space in a room expand. You could also put a large chest of drawers or another large item in front of a window, making it feel that there’s more space behind the drawers. Try not to use heavy framing. Just like with artwork, heavy frames take away space. Clear walkways are very important in a smaller room. However, shoving everything against the wall may not go as well as you planned. Sometimes a piece (and the room) looks better when there is some space between the furniture and the wall. However, nothing should block the view into the room nor should anything be blocking the walkway. If you can’t see the floor, you have a problem – there should always be space for people to walk through. If you hang shelves near the ceiling, the eye will be drawn upwards. It also saves you space that you would otherwise have to give up. These shelves should be a light color, and arrange the objects you are shelving so you can have plenty of space on the shelves. Don’t load the shelves completely, the more space available the more likely the whole room will look bigger. You can also arrange your books and other objects by color. This will draw the eye away from the tininess of the room. Painting a room in a light, airy color will make the room appear larger than it actually is. Darker wall colors absorb light, while lighter colors reflect it making the room seem airy and open and large. The floor can add to the optical illusion of making a small room feel large. The floor and the ceiling are the fifth and sixth walls of a room. Floors should be a light color if you can manage it, however, if you can’t redo your floors, a large area rug that is a light color can do wonders, making it seem like the room is has a few extra inches of floor space. As stated in the last tip, the ceiling should be considered another wall of the room. And with that in mind, you could consider wallpapering it with a light colored pattern or color. Anything that draws the eye upwards will make your small room feel so much larger and taller than it truly is. One large piece of furniture removes clutter from a small room. For instance, if you use one large couch rather than several smaller chairs, the room won’t look or feel as cluttered. Stripes in a smaller room can make your room look much bigger, especially if you’re using a striped rug. You will want to make sure the stripes go the length of the room that is the longest – just like wearing vertical stripes on a shirt or dress makes you look taller and skinnier. Now this is one topic we know quite a lot about. Using a clear or light color around your windows can make a room look larger. Roman shades or blinds work especially well. Just remember that more light equals more space. So avoid using large or heavy draperies in a small room. We hope that these solutions will help you make your room look bigger. If you have any questions or concerns about how you can use window treatments to make your room look larger and airy, you can always call us at (512) 250-8600 or visit us at our store in Austin, Texas. We want to help you make your home beautiful.